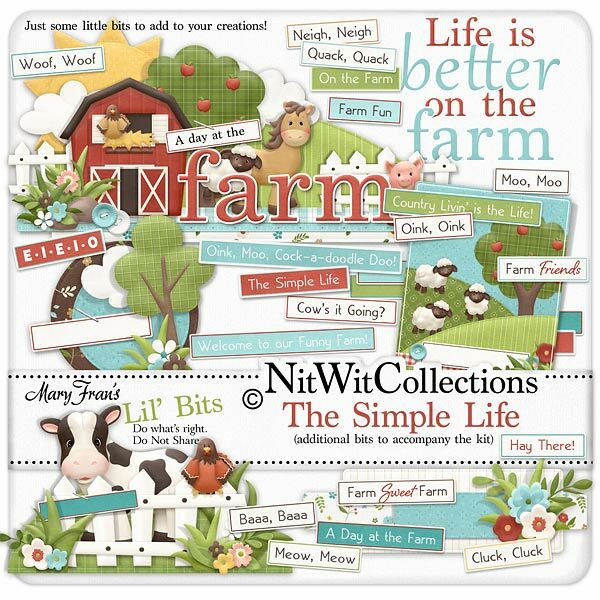 Lil' Bits "Simple Life" adds fantastic ready made scenes and more to your creative options with this digital kit! The scene with the sheep in the meadow under the apple tree, the cow behind the fence with the chicken....you could literally just place one of these digital elements on your card or scrapbooking layout, add some background papers and you're finished! Quick and easy, that's the name of the game when creating with our Lil Bits - Simple Life digital elements pack. Don't miss out on these digital elements as they are not included in the FQB "Simple Life" Collection so don't pass these by! 1 Tag with a tree, grass and sky with a cloud. This will fit any ocassion! How will you use it? 1 Word art - "Life is Better on the Farm"
1 Word art - with the cow and chicken gathered around the fence. Use the blank word tag to write in your perfect caption!